My tip for Foxy Bigo: Let your new players try out the site before (if they want to) asking them to deposit money! 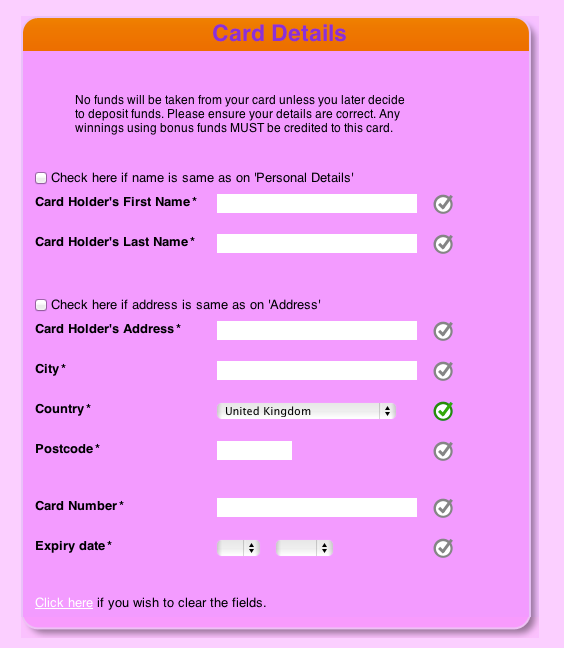 Playing bingo at Foxy Bingo might be fun, but why should I have to give them my credit card details when signing up? Image 1. A part of the registration form. A much better way would be to let your new players look around, play for fun and try out your site before asking them for money. I was one lost customer for Foxy Bingo, and probably not the only one. UPDATE: I was in contact with customer service at Foxy Bingo and asked the reason for having to give away your credit card details when registering. Their response “…Please note that unfortunately our system is designed in such way that you cannot create an account without submitting your bank card details upon registration.“. That is a really bad system!